Best Review I've Ever Gotten! 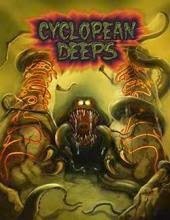 This is the best review I've ever gotten for something I wrote -- Cyclopean Deeps vol 1 -- so I'm geeked. The first couple of paragraphs are about other things, but then it starts the review. The reviewer (who is apparently THE Pathfinder go-to reviewer) is covering the Pathfinder version of the book, not the Swords & Wizardry version, so there's some discussion of the mechanics, but as you'll see the review specifically focuses on the non-mechanical side. It's well timed, too, because the second volume is done and is an add-on to the Kickstarter for Cults of the Sundered Kingdoms, which is underway now. "This manages to elicit a sense of cultural wonder akin to the writings of the classic titans like Gygax, a breath of the magical and uncanny, while also breathing the spirit of the mythos and classic pulp fiction akin to Howard or Haggard. Cyclopean Deeps managed to evoke something I almost never feel anymore these days – a sense of jamais-vu." "As odd and alien the vistas portrayed herein are, they still feel uncannily organic, realistic and alive – which drives further home the point of this book being not only unique, but inspired in the very best way. " "...a sense of decrepitude, of civilizations most vile, fallen to magics even worse, suffuses the paragraphs, with details upon details drawing a picture of a world that could be another, a place so wildly different, yet familiar, that it could be considered an escalation of the concept of the uncanny. "This massive tome breathes more unique ideas in a chapter than some whole series of books." "Author Matthew J. Finch delivers quite frankly one of the most imaginative, awesome books in the whole Frog God/Necromancer Games-canon"
I know there's always a lurking suspicion that something done for charity isn't high quality. In this case, it's high quality. Here's a chance to pick up two AD&D modules and have the proceeds go to research at a Children's Hospital. Everyone involved did their work for free, I've read it, and it's stellar. Art is great (I love Jason Sholtis's eerie, dark, pen/ink work), writing is spot-on, cartography is very high quality, and adventures are excellent. The second adventure is a one-level lead in for you to add levels below if you choose (so be warned, it's "incomplete"), and the first module is complete in and of itself. This would be worth buying even if it were being sold purely for profit. It's pay-what-you-want, but since it's a for-charity effort, please pay something for it. Half-price if you must, full price if you can, and something in between if $5 is a stretch for you. I paid $2.50, because my gaming budget doesn't cover enough modules for me to afford the full $5. If yours does, $5 is a very fair price for these two modules. This year's headquarters over at Gamers & Grognards for Swords & Wizardry Appreciation Day! Originally created by Erik Tenkar of Tenkar's Tavern fame a couple of years ago, today is the day when many old-school (and even not-so-old-school) bloggers post up thoughts about the game, resources for the game, and just plain interesting stuff. Ryan Thompson at Gamers & Grognards is keeping track of all the various blogs and events going on, and later this evening we're doing a live event. Shortly I'm going to kick off some activity over at the Frog God Games Swords & Wizardry forum. I'm told that people can register for the forum without having to give out all the information required for actually buying stuff from Frog God (that has been a technical stumbling block for a while). Some of our timing over at Frog God has been a bit screwy - we're also launching a Kickstarter today for a big campaign resource, Cults of the Sundered Kingdoms, and it wasn't supposed to be the same day as appreciation day, but it got delayed and managed to hit exactly the day I didn't want it to. FORGOT TO MENTION: At the Frog God Website Use the coupon code (once only, and today only) "S&W-33%OFF" to get a 33% discount on everything Swords & Wizardry, including the new Quests of Doom book. ALSO: John Reyst is selling Swords & Wizardry pdfs at 40% off today at the Open Gaming Store! Later today I'll post up some actual game material!